It took a while to remember all the things to do/not do of course, such as not touching the hot metal too soon after welding it, not raising the visor too early and getting a case of arc-eye, and especially not having anything too flammable nearby (I instantly managed to set fire to my entire stock of wire wool!). Although I’ve got lots of projects in mind that will take care, time and effort to visualise, I thought I’d post up my first stumblings. 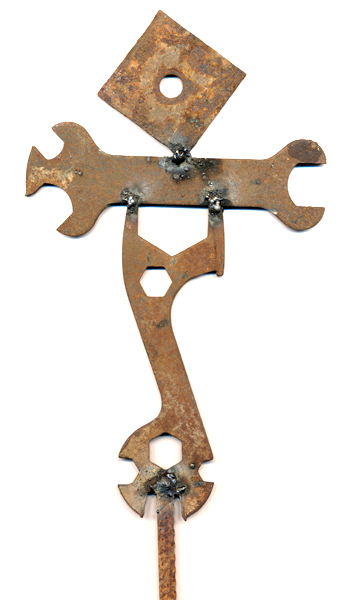 Not sure what it is exactly, but I made this ornament (from old bike spanners and general scrap – it’s about 14cm x 55 cm) to go in my friend’s new garden (I’m guessing it will sit atop a pole or something, and hopefully weather/rust over time to a consistent finish). 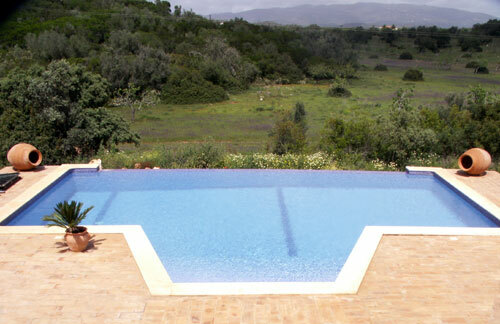 So, here’s my first proper post, written from my friend’s house in the Algarve. I’m here for four days, on a working mini-break, to design and write a corporate ID, website and marketing literature for her new business venture. I’m not going to publish her new web address as yet, as I want to make sure it all looks/works ok before putting the site live for public scrutiny. Suffice it to say, if anyone is looking for a restful holiday in a rural/tranquil setting with fabulous mountain views (and a very cool infinity pool!) then keep coming back to check on progress. I’m also encouraging Jackie to start a blog to record the various trials and tribulations she has encountered pursuing the venture so far – in the meantime, here’s a photo I took of the rear of the property during one of the rare hours of sunshine!